A placesetting for a true fiesta! 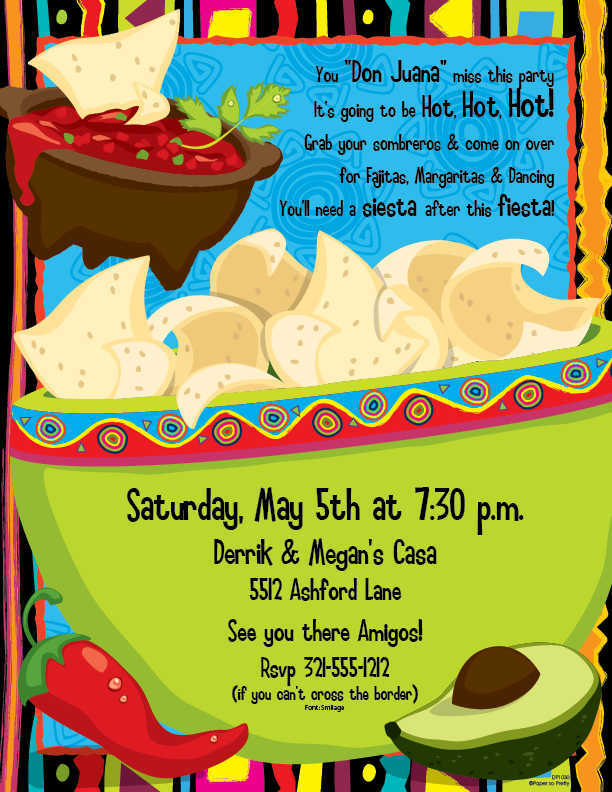 This Cinco de Mayo invitation is decorated with a festive plate, margarita glass, maracas, limes and a chili. Its bright colors make it perfect for a fiesta event! It's a fiesta! 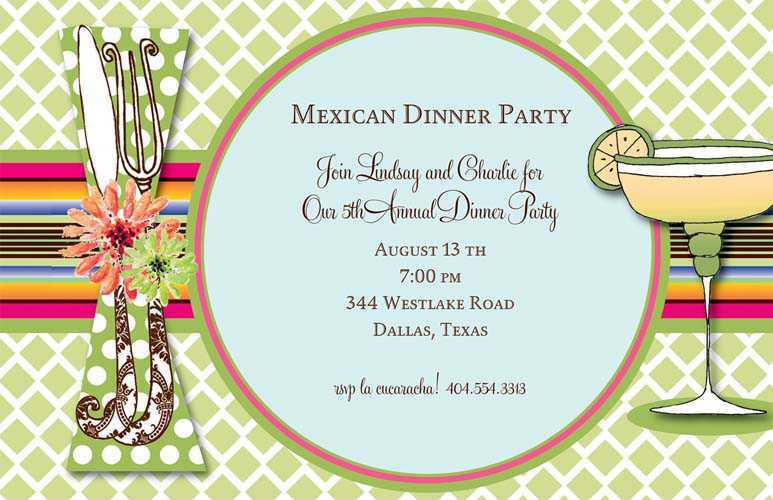 Enjoy your Mexican celebration with an invitation that will accent your party perfectly. A brightly colored banner is hung across this card with two maracas at the bottom, all against a yellow background with a blue border. 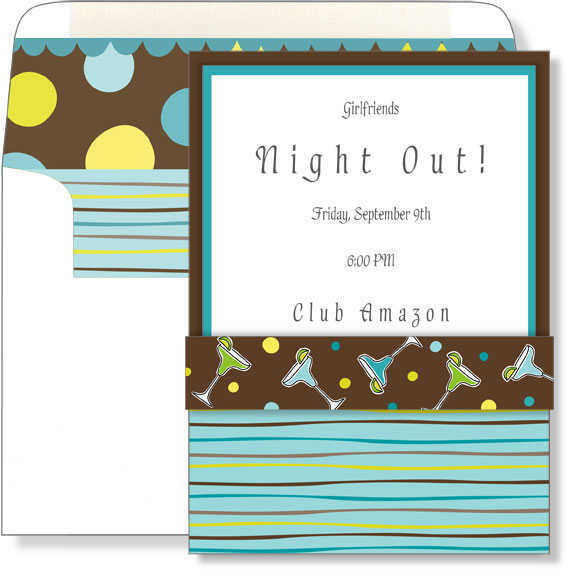 Colorful and fun 3 Piece invitation. Pocket backround card holds imprintable insert card and then both are wrapped with decorative margarita slide that wraps around pocket and is secured on backside of card with easy to use tape dot. Two of your favorite themes! 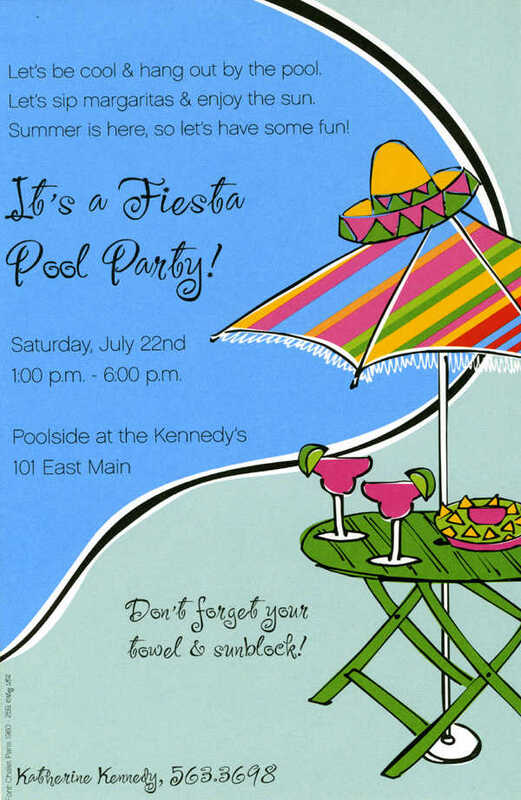 Combine summer fun with a Mexican flair to have the best Poolside Fiesta on the block! Don't forget your flip flops and sombrero! A bright invitation with an orange background. The glittered wiggler says "FIESTA" with all kinds of fiesta themed decorations and easily attaches! Cinco de Mayo is a beloved event across the United States, where we get to enjoy Mexican foods, music, dancing, and most importantly love of celebration. In a melting pot of cultures, this day has been chosen to let the Mexican heritage in us shine. 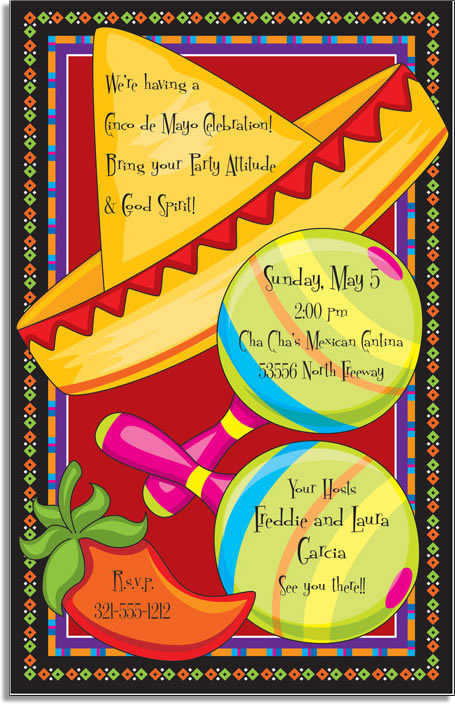 If you are planning to have a fiesta this Cinco de Mayo, check out our fiesta themed invitations that will make your event a perfect hit. 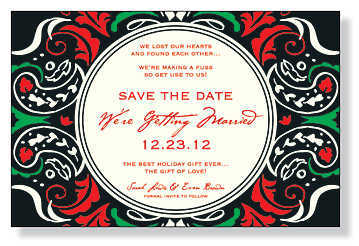 Let us even help you personalize your invitations at ImpressInPrint.com! 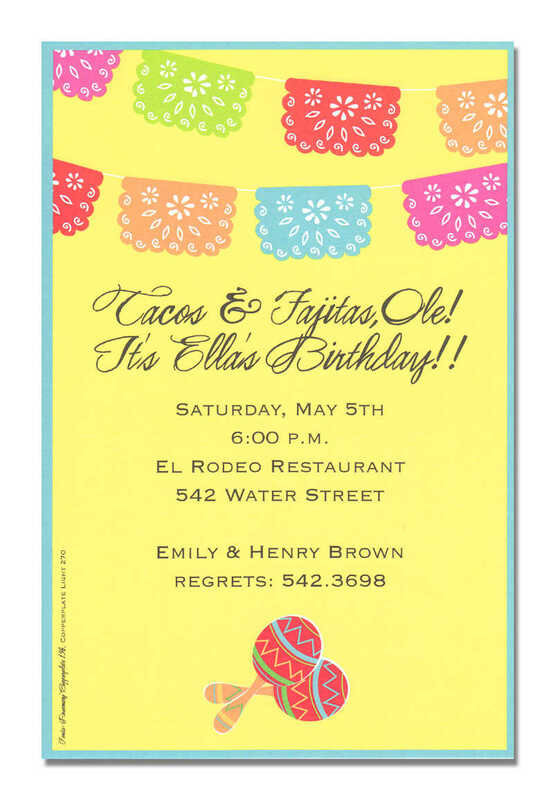 These Cinco de Mayo invitations are great for birthdays, rehearsal dinners, and general fiestas, too! 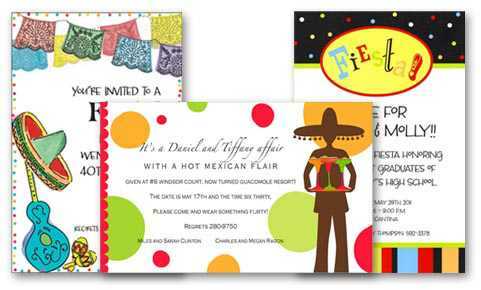 Cinco de Mayo and fiesta invitations have strong Mexican themes to them, quite logically since the celebration is held to enjoy the Mexican culture. There are some particular trends that have caught on more so than others, and that most strongly remind us of fiestas. 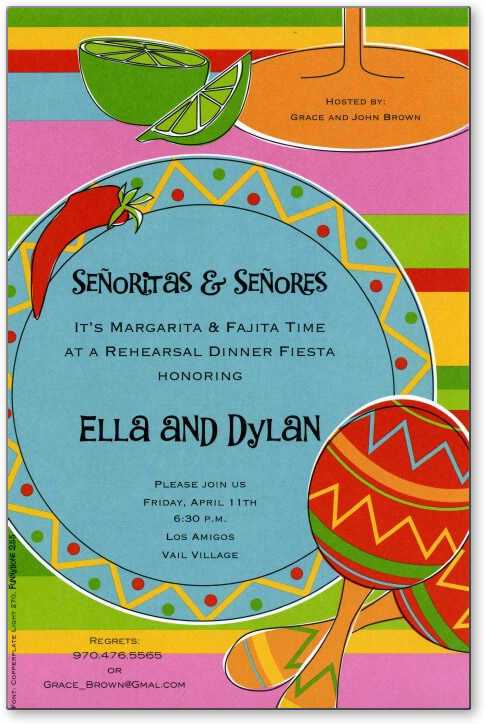 These themes have made it big on Cinco de Mayo invitations, and are repeated in hundreds of unique representations. Though the themes of a Mexican fiesta may be common, the presentation is as unique as your imagination! If you are planning on hosting a fiesta this year for Cinco de Mayo, consider looking for one of these hot trends when selecting your invitation. Margarita - Frosty glasses rimmed with salt and filled to the top with a delicious yellow-green liquid. These limey favorites are an absolute must for an adult fiesta! Sombrero - A wide-brimmed hat often made of woven straw. These hats are often decorated with colorful patterns woven or stitched into the brim of the hat. They may even be decorated with short hanging beads for a most intricate designs! A favorite symbol for a fiesta. Maracas - Specially painted and decorated rattles filled with fine beans and used as musical instruments. They produce a soft and melodious rattling sound found in mariachi music, and the beautiful painting decorations make them an excellent addition to Cinco de Mayo invitations. Chilies - Spicy little peppers in a variety of colors. They may be green like a jalapeno, red like a ripe serrano, or even orange like a habanero. These fun peppers add an easy splash of color to invitations in a cute a festive way. Guitar - A strong sound in a Mexican melody, the guitar also makes its appearance in invitations because of its importance to the traditional mariachi sound. Since Cinco de Mayo is all about partying and celebration, music is a very popular theme! These classics are absolute staples at an Cinco de Mayo fiesta. They make the perfect appetizer and drink for a warm day with extra Mexican flavor. The flavorful spices and the crisp lime will make your afternoon perfect. Arriba! Check out these recipes to complete your Cinco de Mayo party preparations. Fill blender with ice and add in all ingredients. Blend until smooth. Rim glasses with salt. Pour into glasses and serve immediately. To be sure, this does make a delicious margarita. Whether you prefer shaken on the rocks or blended, this recipe is a classic that is well-known and well-loved. However, if you are a true margarita connoisseur, you owe it to yourself to try this recipe. Fill blender with ice and add in all ingredients. Blend until mostly smooth. Having the perfect guacamole can make your Cinco de Mayo fiesta a hit. Mastering this leader of dips is a lot easier than you may have imagined. This simple recipe is all you need, plus some salted tortilla chips! Using a fork, mash the avocado. Add the sour cream and mix--add more for creamier result. Add onions, chilies, lime/lemon juice, salt, pepper, and cilantro. Gently mix together. Save tomatoes until ready to serve. Add and mix just before serving. Notes: Be sure to handle the peppers with caution--these devils are hot and will burn your eyes! When storing guacamole, be sure to place plastic wrap directly on the surface of the guacamole to keep it fresh. Also, adding a squirt of lime/lemon juice to the top helps the mixture stay fresh at the surface. 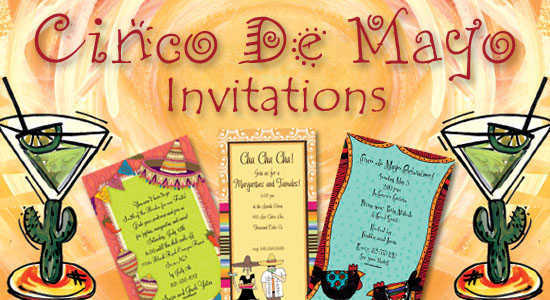 Mix up the margaritas and have a fiesta with our colorful Cinco de Mayo invitations! Cinco de Mayo is not a particularly significant celebration in Mexican culture, but rather a celebration OF Mexican culture in other nations. The day itself commemorates the Battle of Pueblo, in which the Mexican army overthrew the invading French militia against all odds. Unable to pay debts that were due to France, the French lead by Napoleon III attempted to overthrow the Mexican government and establish their own Second Mexican Empire. On May 5, 1861, Mexico proved victorious. Many people have the misconception that Cinco de May celebrates Mexico's final independence from Spain. The actual Mexican Independence Day, and the most important cultural celebration in Mexico, is on September 16th. However, Cinco de Mayo is used across the United States and in several other countries as a day of celebration of Mexican culture and heritage. Generally, celebrations include eating Mexican foods of all varieties, drinking margaritas or tequila based drinks, listening to mariachi music, and dancing. Across the US, Mexican food restaurants will hold special celebrations or discounts on Cinco de Mayo as well. 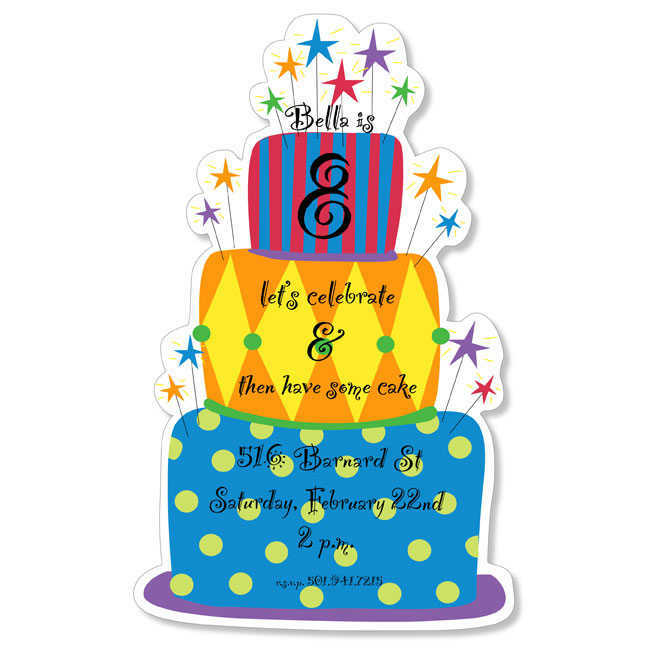 Birthday invitations for any age or year! These celebration invitations will make turning a year older a ton of fun. For rehearsal dinners of all different themes, all perfect for a gathering before the big day. 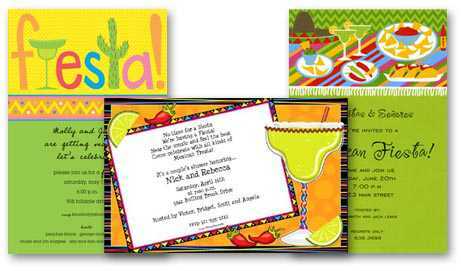 Stationery papers with exciting fiesta themes perfect for a Cinco de Mayo or fiesta themed event! Having a rodeo or a western themed party? 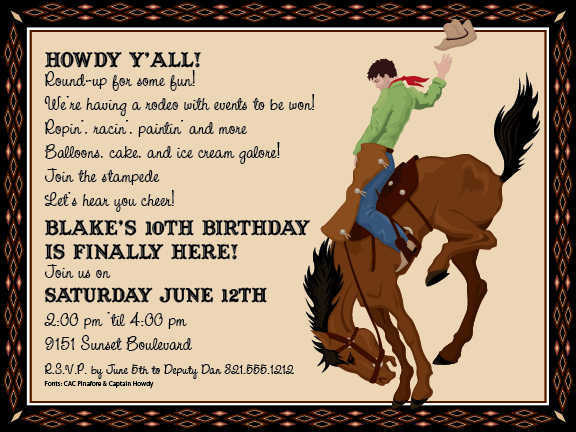 Our invitations are perfect for your cowboy boots and hats event. Let's go bowling! These invitations are perfect for a favorite American passtime. 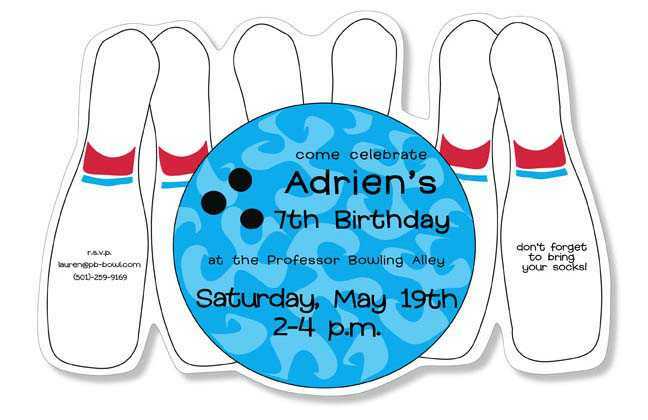 Have a bowling birthday party! Tropical and beach themed invitations great for luaus, themed events, or even the destination wedding.